GRESHAM — Knute Buehler, GOP nominee for governor, made a bold and ambitious promise June 28 to overhaul the state's public education system from one of the worst in the nation to one of the top five in just five years. Buehler, a Bend orthopedic surgeon and state representative for Oregon House District 54, said he plans to achieve that goal by boosting the state budget for education by at least 15 percent and reforming the state public pension program. "It's time to make sure these big problems that have been avoided and made worse by Gov. Brown are resolved," Buehler said. "The single biggest failure of Gov. Brown in her term of office is her indifference to fixing Oregon's public schools." Oregon has the third worst graduation rate in the nation and one of the shortest school years, according to federal statistics. "What is happening is despite record budgets, record K-12 budgets. those dollars aren't getting to kids and to the classrooms because a large percentage, around 50 percent, of that increased budget is going right into retirement accounts," he said. "That's why we need PERS reform so those dollars can get back to kids, back to classrooms (and) … restore the lost school year that Oregon has compared to Washington." Buehler says the state could save $1.2 billion by reforming the Public Employees Retirement System. Some reforms he has proposed require existing and new employees to contribute at least 6 percent to their retirement plan, cap annual pension payments at $100,000, transition PERS to a 401K retirement plan and cap pay raises at 3.4 percent. "With those changes, we will be able to return about $1.2 billion back to the education budget and … move Oregon schools from the bottom five to the top five in five years," Buehler said. He said he would force lawmakers to address the issue by refusing to sign any new spending bill until the PERS reform legislation was passed. "The Oregon governor has some real leverage points," he said. "One of the most important tools to encourage lawmakers to do the right thing is line-item veto authority that can't be overturned without a two-thirds vote of both the Oregon Senate and House and being able to say, no new spending, no new programs … until we solve this problem the single biggest most important problem in Oregon." Brown's campaign responded to the plan by attacking Buehler's voting record on education spending. 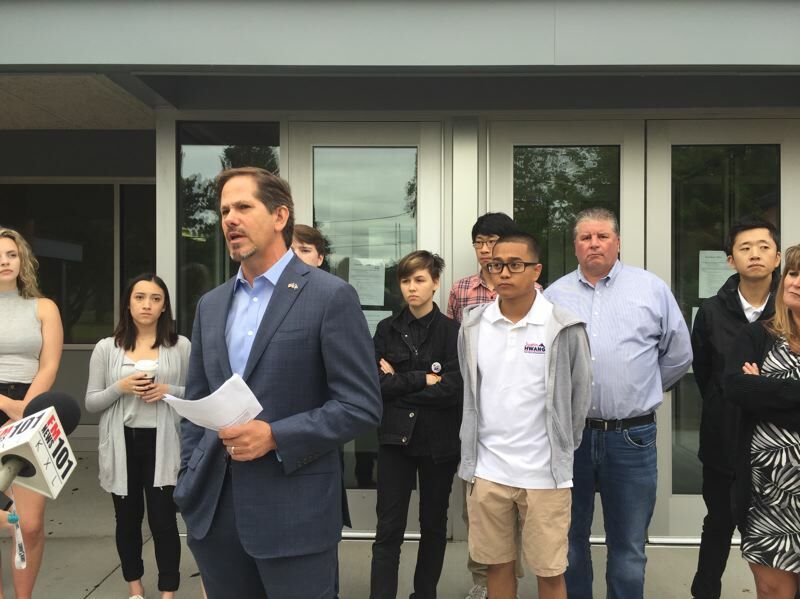 "Like so many times during his political career, Knute Buehler had a chance to stand up for students and invest in classrooms and he voted no." said Christian Gaston, Brown's spokesman. "It's a disturbing pattern."